A man has been convicted of a £500,000 armed jewellery heist at Gleneagles Hotel. Richard Fleming, 42, used hammers, a pistol and a machete during the raid last June. A jury at the High Court in Edinburgh found Fleming, from London, guilty of assault and armed robbery at the five-star Perthshire resort. Another man - Liam Richardson, 30, admitted his involvement in the robbery at an earlier hearing. Fleming and Richardson were part of a three-man team that stole 50 Rolex watches from the Mappin & Webb boutique at the luxury hotel. The High Court in Edinburgh heard how staff at the hotel thought the gang were carrying out a "terrorist attack". The trial was told that the trio was dressed in black. Fleming personally threatened employees Louis Hutchison, 48, and Euan Wishart, 36, with a gun, a machete and hammers. After a raid that lasted approximately two minutes, Fleming and his accomplices escaped from the scene in a high-powered Audi sports car, which they dumped nearby. 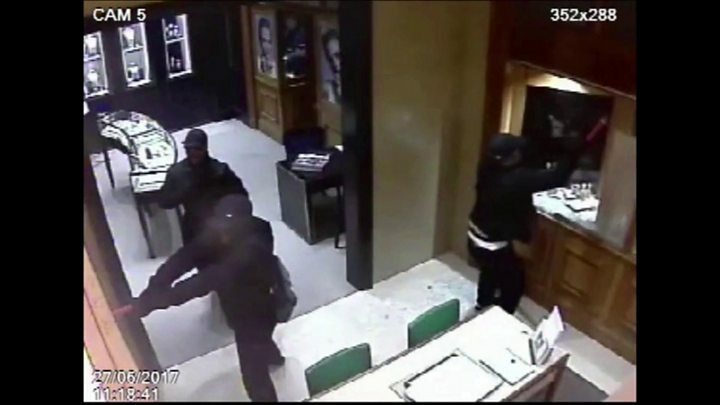 They had taken 50 out of 51 Rolex watches that were on display at the boutique. The watches had a total value of £516,750 and have never been recovered. The robbers then drove to Glasgow in a Range Rover Evoque, which had been stolen earlier from London. It was later found burned out in a cemetery in the city's east end. After finding the car, detectives analysed "tens of thousands of hours" worth of CCTV recordings and studied mobile phone records, which placed Fleming and Richardson at the crime scene. Fleming maintained he was innocent of any wrong doing and had claimed that at the time of the robbery he was buying drugs in Parkhead, Glasgow. Richardson, of London, pleaded guilty to armed robbery at the start of his accomplice's trial last month. Prosecution lawyer Jane Farquharson told judge Lady Carmichael that Fleming's criminal career started in 1994. In February 2007, he was convicted at the Old Bailey in London and given a nine-year sentence for possessing a firearm. Richardson's offending began in 2008 and has convictions for dishonesty and violence. Judge Lady Carmichael deferred sentence for the court to obtain background reports on the men. They will be sentenced at the High Court in Edinburgh on 24 October.